When I was in Nashville a few weeks ago, I had an awesome food truck breakfast that bears recreating and repeating! And in fact, I don’t even want to recreate it again for breakfast, but for dinner! Everyone loves breakfast for dinner, and in my house, everyone loves taco/burrito/grain bowls. Mainly because there’s a base (typically rice, cauliflower rice, quinoa, or couscous), and then just a bunch of toppings that everyone gets to pick for themselves to customize their bowl however they like. 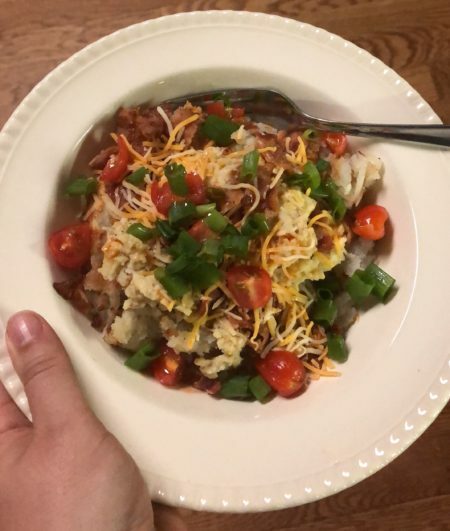 So why not combine the two ideas and create a super easy and family-friendly dinner, the breakfast bowl! The food truck breakfast I had in Nashville was a hashbrown breakfast bowl- loaded with cheese, and eggs, and sausage, and bacon, and you name it, it was in there. And it was delicious! Of course it was great for breakfast, but it would be a GREAT, easy, kid-pleasing dinner, ready in about 30 minutes. Here’s the “recipe,” or more like the list of ingredients that I used to make Hashbrown Bowls for dinner. The best part is that you can customize it and mix it up to suit your and your family’s tastes. Try it out and let me know what you think! sausage andouille, chorizo, polish, breakfast, chicken sausages all will work! Cook hash browns according to package directions. Meanwhile, fry the bacon and sausage until cooked through, and scramble eggs until set. When hashbrowns, bacon, sausage, and eggs are all done, add a layer of hashbrowns to each bowl. Layer with eggs, then sausage and bacon. Top with cheese, diced tomatoes, and green onions. Top with salt and pepper, and hot sauce to taste.